Hundreds of books could be written about the miracles of Saint Myron of Crete alone, going back many centuries. Below are just a few from the past hundred years or so. 1. In 1930, Lambros Zacharis, the director of the magazine "Family Life", was healed through the miraculous grace of the holy water of the Saint, who at the time served as a preacher of the Metropolis of Rethymnon and Mylopotamos. He suffered from a serious eye problem and had lost much of his vision. Having heard of the miracles of Saint Myron, he went to his grave, prayed, washed his eyes with holy water, and immediately became well. Since then he would often return to thank Saint Myron for the miracle. 2. During the years of the German occupation in the 1940's, many miracles took place through the intercessions of Saint Myron. When the German troops departed, the grace of the Saint prevented the bombardment of the village, since, while the weather was good, suddenly a black cloud covered the sky, and the Germans were unable to locate the target, therefore they abandoned the effort and fled. 3. 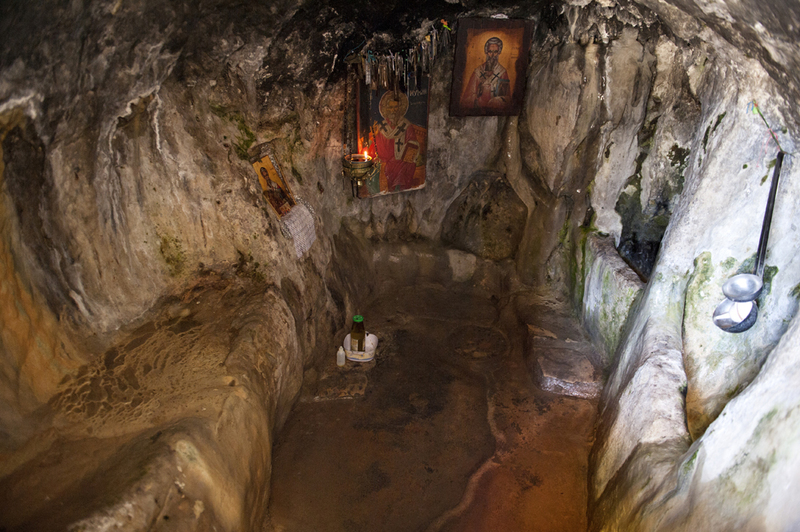 In 1969 Nicholas Papadakis, a resident of Agios Myronas, was saved from certain death after a landslide during work in the drainage duct of the church. It had been dampened with the soil for more than an hour and a half. When his fellow villagers identified him and removed the dirt from off him, he did not show signs of life, as the community doctor John Makrygiannakis had also found. Then they brought holy water from the cave of the Saint, threw it on his face, and immediately he began to come to himself. As it was later found out from tests he did not suffer anything serious. Till the end of his life he narrated the miracle and thanked the Saint. 4. During the same period of time, Constantine Komaras, a resident of Halandri, was healed of a severe eye disease, when his mother asked, with tears in her eyes, for a little holy water from Martha Tamiolaki, from Agios Myronas, and with it anointed the eyes of the child. Immediately after he became well. 5. 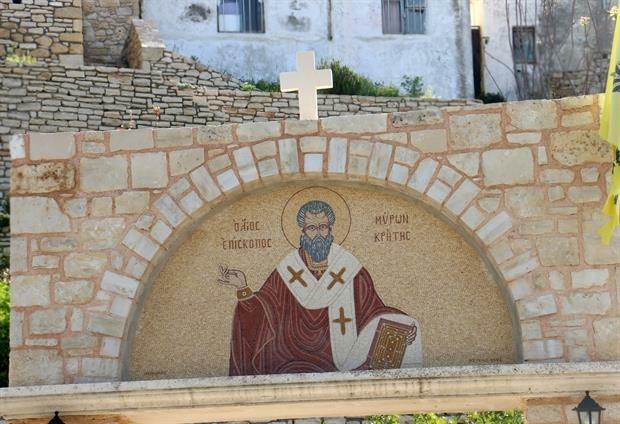 In 1977, Eleni Synodinou, a resident of the village of Messagros, sent a letter to the parish priest of Saint Myron's, Stylianos Rodamakis, telling him that with the help of the Saint her father became well who suffered from severe lung disease. The Saint, a venerable elder with a white beard, appeared in her sleep, telling her how he came from Crete and was a protector of her family. She asked and learned information about the Saint, and as soon as her father became completely well, she came to give her gratitude at his sacred church. 6. In 1988, Evangelia Linardaki, a resident of Agios Myronas, suffered from cancer and underwent a mastectomy. But her health was not restored, on the contrary she was getting worse day by day. She invoked the grace of the Saint and the complications, without medical intervention, ceased while her health was fully restored. 7. In the same year the miracle with deaf and dumb Irene from Komotini is also mentioned. Her mother, having heard of Saint Myron, came to ask him to cure her child. Indeed, as the kneeling woman prayed in front of the tomb, the child began to articulate some words. It followed the celebration of the Divine Liturgy, during which the child began to speak normally, which aroused the admiration and awe of the faithful. 8. For a long time, G. Brahassotakis, a resident of Heraklion, suffered from cancer in the glands. In his dreams the Saint appeared and told him to come wash with the holy water to become well. Indeed, after he came and washed, he drank holy water and day by day his condition began to improve. 9. In 1997, John Marketakis, the commissioner of the holy church, came to pray for the success of his son in the TEI exams. Coming to the church and putting the key to open the door he heard a terrible squeak and the door began to shake like an earthquake. Frightened he opened and walked in. The church was fragrant, and when he approached the tomb of the Saint he saw the lamp swinging back and forth. Then he realized that this was a good sign. Actually his child passed the exam. 10. The same person, two years later, learned from doctors' examinations that he had a cyst in the kidney and that he had to have surgery as it could have evolved into something very serious. Upset by this news he resorted to the grace of the Saint. 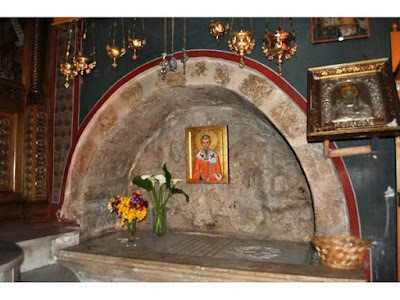 The priest of the church, Father Nikolaos, blessed holy oil from the tomb of the Saint. In the examination that followed the cyst was nowhere to be found. 11. 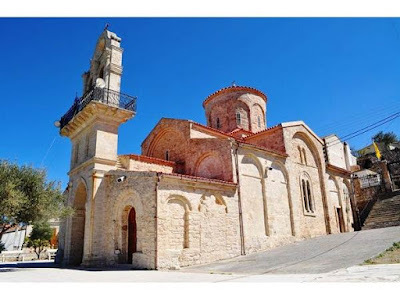 In 1998, on Good Friday, a woman from the village of Megali Vrysi in Heraklion, who had a son that was sick, came to the Church of Saint Myron. The Saint had indicated to her in a vision, the source of his illness. When she woke up and found that what she saw in her vision was real, she broke into sobs. Her faith and devotion helped her to make her son well. 12. In 1998 Irene Sfakianaki, a resident of Heraklion, entered the preterm birth process. During the difficult times, and while the doctors were panicked that the child suffered something or was born with a problem since it was premature, she prayed and made a vow to Saint Myron that if he be born healthy the pounds of his weight she would offer in candles the same amount of pounds to bring to his church. Indeed the child was born well and since then every year they visit the holy church. 13. In 1999, the priest of the holy church, Father Nikolaos Kritsotakis, after the dismissal of the Divine Liturgy, felt intense pain in the heart region, which worried him because it was not the first time. 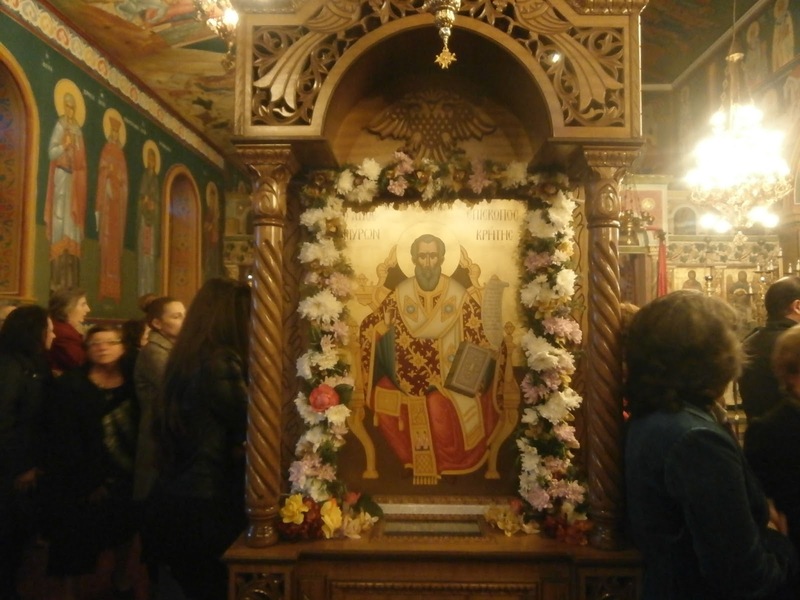 He stood before the icon of the Saint and begged him to help him. The dawn of the next day he saw in his sleep that while in the Sanctuary of the church, the Saint came from the north gate and greeted him with sympathy and mercy. On the same day he went to Heraklion and underwent medical examinations, during which the doctors found that there had been a problem but it was overcome. 14. In 1997, during the week prior to Palm Sunday, during the Wednesday evening Presanctified Liturgy, it was found that the tomb was sweating the Holy Myrrh, which fragranced the whole church. This fragrance diminished and increased until Easter, while it was particularly intense during the days of the Passion and Resurrection. 15. The same thing was repeated in 2001, from the morning of Great Saturday onwards. 16. In the same year, during the Vespers of the Saint's feast, his icon in the proskynitarion began to richly gush forth myrrh. 17. Sometimes, also, there are slight sounds as if a staff is knocking from the inside of the marble tomb, which is interpreted as an expression of great favor. This favor and the protection of Saint Myron can only be felt and understood by those who really believe in him and the God he represents. The power of faith in God is great, and it alone can bring people out of the deadlocks of our daily and ephemeral life.